Bombfest is one of those rare games looking for big answers to important questions. Since the dawn of time, humans have been pondering, “What do we do when a group of us get together in one place?” The cavemen thought board games like Monopoly or Sorry! were the answer. Throughout the ancient times, when our sense of humor was still developing, we thought it was Apples to Apples or Cards Against Humanity. Then the early 17th century brought us the YouTube crawls—simpler times. But now we’re firmly in the era of party video games. While mostly occupied by Nintendo titles such as Mario Party and Mario Kart, the party game has been a staple of the last 200 years. 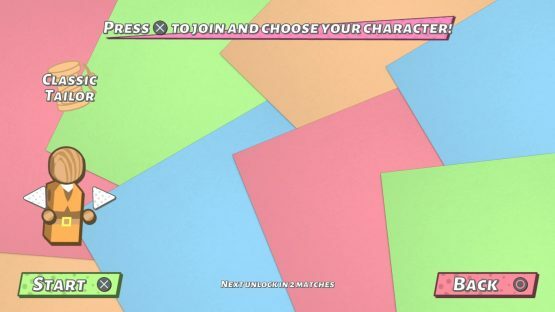 The popularity of games such as The Jackbox Party Pack proves that people are still looking for new ways to entertain their guests. Enter Bombfest, an indie party game where four people play with wooden toys and throw bombs at each other. It is a simple, accessible premise, for sure, but will it be the next thing to bust out at your next social gathering? Bombfest is incredibly easy to pick up and play, perhaps more so than any other party game. You hit play, and you’re thrown into a practice area where the game shows you its two buttons. Yes, that was two buttons. There is the jump button (which is really more of a dive-out-of-the-way button), and the pick-up/throw bombs button. You move with the analog stick, of course. Then, you jump through a dog door into a house and start making folks explode. Bombfest‘s ease of use is undoubtedly a bonus for a party game. All anyone has to do is pick up the controller, remember what two buttons do, and have a lot of fun. While this could easily get monotonous in a hurry, Bombfest has a great progressive unlock system. After every two to three games or so, you are treated to a new unlock. Whether its a character, a map, or a new kind of bomb (the most coveted prize), these go along way toward keeping the game fresh. The game uses what appears to be a Smash Bros-esque system for health and for eliminating players. Your goal is to get the three other players off the map. You can knock them off the map with a well-placed explosion, but you can also hit them enough times so that the next hit will send them soaring out of the bedroom like a missile. I was definitely worried this was a “get hit by the bomb and die” game, but Sudden Event Studios saw a way to inject a little more longevity to each session, and that was a great idea. While the bombs make up the bulk of the gameplay improvements, you can also unlock a significant amount of cosmetic items. You can unlock an Apothecary, and make him posh with top hat and a fancy mustache (An aPOSHecary, if you will). After at least a dozen hours of play, I still haven’t unlocked everything (more on that later). On the face, this is an impressive feat. Bombfest entices you to continue playing, constantly reminding you that the next unlock is just around the corner. Like the Uber driver app queuing up the next fare before your current fare has even arrived, Bombfest wants you to binge, and I was happy to oblige. 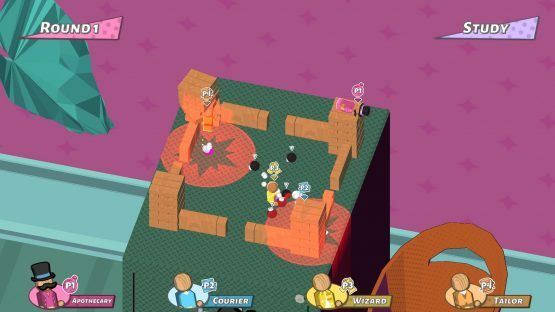 For all its charm, which Bombfest has in spades, putting four players together in small, confined spaces hurling explosives at one another can be just as chaotic as it sounds. It can be incredibly hard to follow the action, and I do fear there will be confusion and accidents. Bombfest could benefit greatly from a countdown screen at the start of each round. Each player’s starting placement is randomized, but the player models aren’t distinct enough to immediately suss out where you are. I can’t tell you how many times I’ve simply walked off the edge of the map thinking I was another person. (Although one time did result in an achievement, so that’s cool, I guess). Those couple extra seconds to find your bearings would go a long way. More than that, the scoring system is also a little suspect. It makes perfect sense on paper. You get one point for eliminating a player, minus one point for eliminating yourself, and three points for surviving the whole round. You also get plus-or-minus two points for eliminating a player or yourself, if the eliminated player was the point leader. While that, in and of itself, is not confusing, the chaotic nature of Bombfest makes this hard to follow. It’s easy to think you eliminated one or more people only to get to the score screen and see a big fat goose egg next to your character. Them’s the breaks, I guess. In fairness to Bombfest, I’ll start this out by saying that the Kickstarter page has indicated Sudden Event Studios’ desire for online multiplayer. That said, as of release, all multiplayer on all platforms is purely local. You can only play with as many people as you have controllers. Because of the dearth of couch co-op games, it’s not often that you see one person with four PS4 controllers, which can make for a very lonely party. You can still play the game with one or two players, because Bombfest will put AIs in place of the others. These AIs are good, not great, with actions that range from virtuoso to blithering idiot from one moment to the next. This makes single player a little dull, which is why I still haven’t unlocked everything—I just didn’t have the motivation to power through. But that’s fine. Party games are not meant to be played single player, and I wouldn’t count that as a mark against the game. The real mark against it is the difficulty with which you can play multiplayer. Weird games like Golf With Friends are getting way more traction than Bombfest, simply because of the ease of multiplayer. I can be at home, by myself, and jump on a game with three other friends also at home by themselves. This is an advantage that other party games have over Bombfest. Again, I love couch co-op, but it should play wingman, not fly solo. While not without its issues, Bombfest is a welcome addition to the party game genre. I loved its creativity and explosive potential for a ton of a fun in a small package. The progressive unlock system is a brilliant addition that keeps the game fresh well into the double-digit hours. Bombfest review code provided by publisher. Version 1.01 reviewed on a Standard PS4. For more information on scoring please see our Review Policy here.